I often tell my husband he needs to write a book about how to be an awesome partner to a pregnant person. It seems more likely that I’ll write a blog post about it though, so here we are. My husband was a superhero supporter through my pregnancy (and beyond). So this is a post for the partners. It’s worth reminding the world that usually, pregnancy involves three key players. Mums get most of the attention, so this post is celebrating expectant Dads and non-carrying partners. 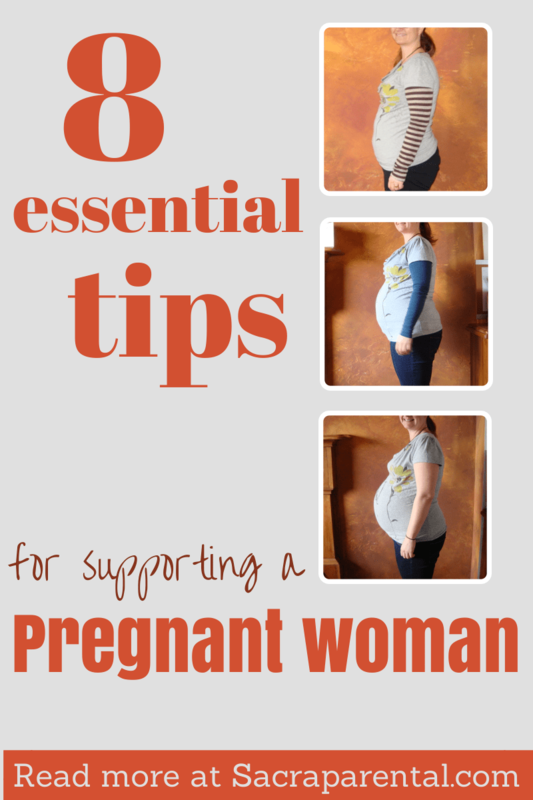 Some of the tips may also be handy for other friends and whanau who want to be super supportive. It’s her job to take folic acid, avoid camembert, have her blood pressure taken, be weighed more and weigh more, and maybe do pregilates. It’s your job to be a superhero support partner, and that’s not nothing; it’s a role with a proper job description and everything. And it’s handily set out for you below! My husband is Not A Morning Person. Between an affectionate relationship with the snooze button and the years of professional training in getting from hibernation to full working consciousness in two minutes flat, he’d really rather stay in bed as long as possible. But for my entire pregnancy, beginning because of morning sickness, he got up as soon as I was awake to get me breakfast. That’s dedication. If your partner is in the 50 per cent that get nauseous, particularly in the first trimester, this is a really important job. Eating before you start moving is a key tip for settling the stomach, so a partner who brings you breakfast in bed is gold. 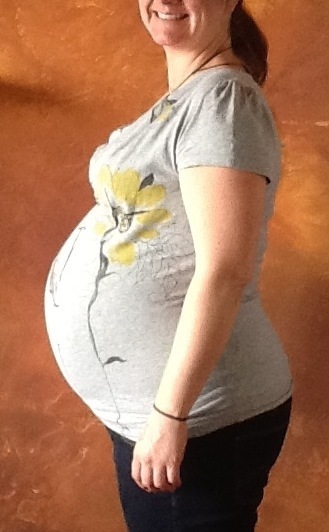 Even if a pregnant mama feels fine about the physical changes (or shall we just say getting enormous?) of advanced pregnancy, it can be a bit demoralising to see all your favourite underwear getting stretched and holey and sad. My clever husband (and don’t worry, this isn’t really too much information) very thoughtfully bought me three pairs of my favourite knickers, when I was about seven months along, as something to look forward to. Obviously the baby was the main thing to look forward to. But pretty pants are nothing to sneeze at. I am, or try to be, of the school of thought that says pregnancy is such a huge blessing that it’s downright rude and ungrateful to complain to people who aren’t pregnant about the various pains and inconveniences that come with it. Mostly that’s how I try to be. Partners are the exception, though! They get to hear it all, since they’re just as lucky as the preggy one, and you’ve got to be able to tell someone about the (take a deep breath and read this out loud if you’re up for an honest list, but skip this paragraph if it’s not what you need right now): nausea, vomiting, constipation, swollen legs, swollen hands, snoring, faintness, fatness, jumpy legs, insomnia, high blood pressure, low blood pressure, diabetes, dietary restrictions, examinations, exhaustion, acne, varicose veins, hot flushes, sciatica, back pain, joint pain, sore breasts, headaches, pre-eclampsia, bleeding, kicking in the ribs, dancing on the bladder, not to mention labour! Most women don’t have nearly that long a list of troubles, and most are fundamentally happy to go through it to get to the other side, so don’t get us wrong, we know we chose this (or at least the 60 per cent who planned the pregnancy did). But it’s hard damn work, pregnancy, and if you want to carry your part of the load as a supaerhero supporter, here’s your job: be sympathetic. Often and sincerely and with the odd bunch of flowers. Thanks. Help us to be gracious around everyone else and help us to know we’re understood so we can get past the difficulties and on to the gratitude. If your partner has grown up in a culture that tells her beauty is thin, she may have some trouble with how she looks as she and the baby grow. Unravelling all that junk is a lifetime’s work, but your voice is the most important in the world for it. Make sure you realise yourself how gorgeous she is. And then tell her, all the time. Enjoy taking photographs of her changing body and help her enjoy the progress. No one can predict how pregnancy will affect any one human being. But I feel confident that a massage will help your partner. It might be her feet that need the attention, after she’s been carrying around that extra 15-25 kilograms (baby+ all day. It might be her back for the same reason. Or maybe just a head or neck rub to help her relax and deal with any anxiety that’s creeping up. My husband very generously gave me leg massages in the middle of the night, practically in his sleep, when I started getting restless legs and insomnia in the second half of pregnancy. What a superhero! I don’t need to repeat the list of discomforts and inconveniences that can accompany pregnancy to make the point that as well as being wonderful, hosting a growing baby is flipping hard work. There will be lots of ways you can help your partner through the various difficulties. Sometimes it will be in practical support (type of deodorant, favourite foods that caused nausea, Guitar Hero), sometimes in a spirit of solidarity (alcohol, nuts, brie). Quiet, non-martyrish sacrifice is a lovely gift to offer your partner while she lets her body be invaded by a (lovely, miraculous, much-loved) life-sucking parasite. This was my policy: you can’t go around all day burbling about how cool it is to be pregnant. You’ll bore some people and hurt others. But for me, I really was excited all the time. So you have to be able to celebrate that at home. Superhero partners – keep being excited about this new arrival. And when your partner has moments of fear or anxiety, as well as accepting the mixed emotions, remind her how wonderful it will be to meet your baby on the outside. Not long now! When I was a pastor I was lucky enough to have a brilliant external work supervisor to help process decisions and interactions. She was a very wise woman, and once characterised the father’s role, in the early days of a baby’s life, as being a protective buffer between the world and the unit of mother-and-newborn. This begins in pregnancy, of course. One of the important jobs, particularly during a first or difficult pregnancy, is to protect the mother from the horror stories that people inevitably try to share with her. Be her Star Wars force-field! It’s natural, when chatting, that people want to share their own story that matches someone else’s experience. ‘I know what you mean!’ we are trying to say. Sure. But I tend to think it wise to pause and self-censor if the thing you want to share is negative. Will it help your friend to tell them your story of someone suffering from the illness they’ve just been diagnosed with? Or would listening to how they are feeling be more helpful? This kind of conversation happens a lot in pregnancy. People often try to tell you the story of their (or their friend’s/partner’s/cousin’s) very difficult pregnancy or labour. Fair enough that they have an experience to share, but now is not the time. So, superhero partners: your mission is to cut off that conversation whenever you hear it. Difficult, I know, especially if you are particularly polite or introverted. But something like: ‘Actually, right now we’re keen not to focus on what can go wrong’ or ‘Could you please wait and tell us that story after the baby arrives safely?’ will usually do the trick. You may need to practice in front of the mirror. Seriously, whatever helps. Non-carrying partners need all the support and help they can get, so please share your tips and advice here. What helped you? What have you seen work well? If you’re a mama, what did you need or appreciate most? Please leave a comment with your thoughts. And if you reckon some of this is helpful, please use the buttons below to share with expectant friends. This is a revamp of two previous posts, now in one handy spot. Some of the comments below are from the original post and some are new. My top tip to partners is to remember (and help your partner to remember) that she is still a person, not just a pregnant person (and, later, certainly not “just” a mother) – and it’s ok (for which read “necessary and important”) to talk about non-baby things some of the time. He is indeed a superhero! My tip is that no request is too ridiculous! We played “Guitar Hero” far too much on the Wii when I had morning sickness with H. I became conditioned to feel sick whenever I heard the Guitar Hero songs, so he had to refrain from playing Guitar Hero for the whole of the rest of my pregnancy and for the whole of my second pregnancy! Still feel queasy when I hear those songs now. We watched Masterchef UK during the gruesome early days of my first pregnancy – and that woman who does the voiceover still makes me feel ill whenever I hear her on any programme! My husband had to switch from spray deo to roll-on for much of my pregnancies, I couldn’t stand it. Glad it’s not just me with these strange aversions! That is hilarious (I mean that in a sympathetic way, of course)! Much better than my aversion to gingernut biscuits (recommended to eat first thing in the morning to avoid nausea) for the same reason. No gingernut biscuit? Now that would be a crisis! My second premature baby arrived this week. We have really appreciated my boss who has taken my older daughter for a few hours each day to allow my husband and I to spend precious time with our new arrival. Typical that she arrived this week just as my parents and sister were out of town for a family wedding.